Samuel Parkes Cadman’s lived in the Old Park district of Dawley for a time when he was a child, although he was actually born in the Ketley area to Samuel and Betsey (Parkes) Cadman, one of 8 children. The son of a miner, he followed his father down the mines at a young age, working as a ‘pony boy’. While waiting for his tub to be unloaded, he habitually read his bible. Samuel Parkes Cadman spent 10 years as a miner, during which time he became a lay preacher at Methodist chapels throughout the Dawley area. His father and grandfather were reputedly ‘hell-fire’ Methodist preachers. 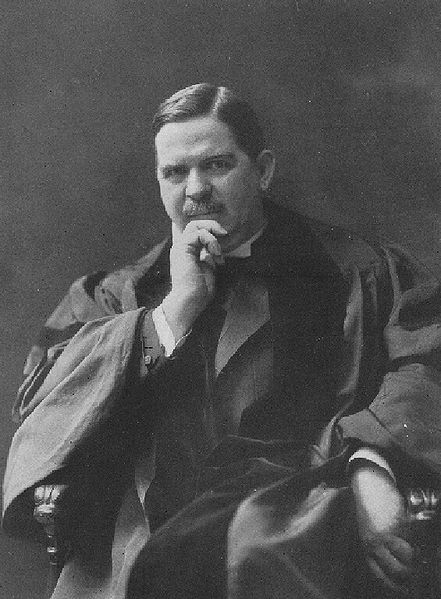 At sixteen, Parkes Cadman was inspired to enter the Methodist Ministry by a service held by the Reverend J.M. Pascoes at Dawley Methodist Chapel. The young student went to London to study Theology, and subsequently to train for the Methodist Ministry at Wesley College, Bristol. For the rest of his life he was renowned for the eloquence of his preaching style. In the 1890s, the recently ordained Minister, now married to Esther Lillian Wooding, emigrated to America, and became pastor at a Methodist church in Millbrook, New York, preaching to about 150 people. In 1895 he was appointed to the Metropolitan Methodist Church in New York where his oratory attracted large crowds. In 1901 he was elected Minister of the Central Congregational Church in Brooklyn with its roll of 3000 members, a post held for the rest of his life, whilst in the 1920s he became President of the American Federal Council of the Churches of Christ. It was in 1923, however, that Parkes Cadman became a pioneer of the new medium of radio broadcasting, his powerful voice and complete confidence in his message soon acquiring a considerable following. His sermons reached the ears of millions. His use of the media extended to journalism in 1926 when he began writing a daily column for the New York Herald Tribune, syndicated nationwide as ‘Dr. Cadman’s Daily Column’. He also established his reputation as a writer through numerous books exploring life from a Christian perspective. Samuel Parkes Cadman made a yearly visit to see family and friends in Dawley when he also took the opportunity to preach, invariably to packed chapels. He died quite suddenly in New York and was finally laid to rest in a family plot in Kensico Cemetery, New York in 1938. • Started work as a miner and at sixteen he was inspired to enter the Methodist Ministry. • He emigrated to America, settled in New York and soon became a renowned Minister there. • He became a world famous minister, preacher and religious writer. • He was renowned for the eloquence of his preaching style and through radio broadcasting he reached the ears of millions. • Every year S. Parkes Cadman visited the Dawley area and took the opportunity to preach. • He died quite suddenly in New York and was finally laid to rest in Kensico Cemetery, New York in 1938.